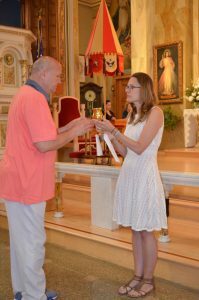 Those wishing to become Eucharistic Ministers must first contact Fr. Steve. After initial contact, you will be instructed to participate in a workshop for Eucharistic Minister sponsored by the archdiocese. After completion of the archdiocesan workshop, you will have another workshop with St. Hyacinth staff.